The main difference between Save and Save As is that Save helps to update the lastly preserved file with the latest content while Save As helps to store a new file or to store an existing file to a new location with the same name or a different name. When working with computers and using applications such as Microsoft Word, it necessary to perform various activities such as opening files, editing, and saving. After creating the necessary documents, the user can preserve them for further use or modification. Two methods to store the current work is by using Save or Save As. Although they appear to be similar, they have some differences. Assume the user created a Word document in the desktop and typed some content. If he goes to the top of the screen, there is an icon which looks like a disk. 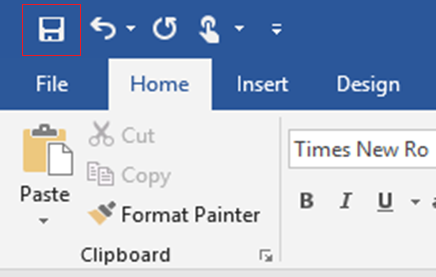 After pressing that icon, the content is saved to that document. When closing the file and reopening it again, the user can view those written content. 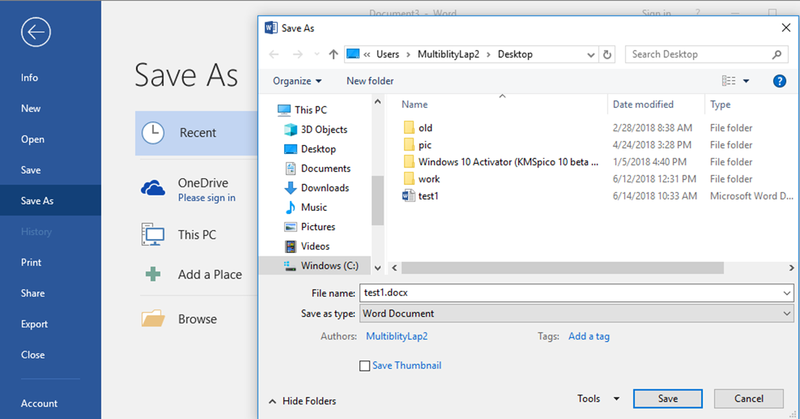 Another method to Save is by going to the File menu and selecting Save. While working, the user can click Save to update the completed work up to that point. Each time the user press Save, it will overwrite the document with the latest content. Assume that the user goes to Microsoft Word and add content to file. When he presses the save icon, it will open the Save As Dialog box. From that, the user can select the location to store the file with file name and file type. Here, the file name is “test1”, and it is a word document. Then he can press save button. If the user wants to save that already created test1 file to some other location with the same name or a different name, then also he has to use Save As. Therefore, it helps to create backup files. Save is a command in the File menu of most applications that stores the data back to the file and folder it originally came from. On the other hand, Save As is a command in the File menu of most applications that allows to store a new file or to store the file in a new location. Save helps to prevent data loss and to update the lastly preserved file with the latest content. 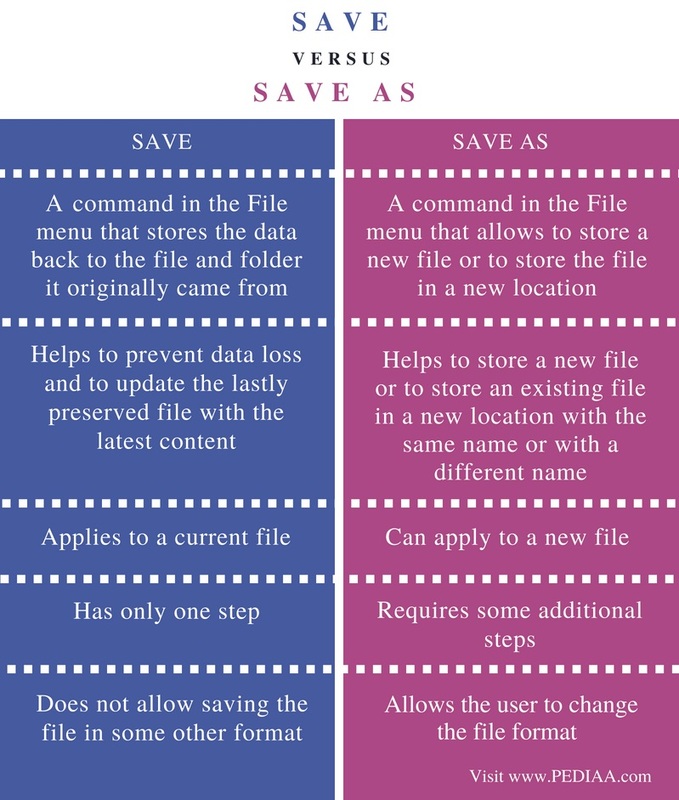 Save As helps to store a new file or to store an existing file in a new location with the same name or with a different name. Save applies to a current file. On the other hand, the Save As applies to a new file. Save is easier as it has only one step but Save As requires some additional steps. Save does not allow saving the file in some other format. But it is different with Save As. It allows the user to change the file format with the Save As dialog box. The difference between Save and Save As is that Save helps to update the lastly preserved file with the latest content while Save As helps to store a new file or to store an existing file to a new location with the same name or different name.